My grandma called me and asked me to cook something because they were busy cleaning. So I asked, “What am I going to cook?”. Then she said, “just look for it in the kitchen.” I saw ground pork, potatoes and carrots so the first thing came to my mind “Ah! I know this! I know what to cook!”. It’s my favorite dish! I cooked few delectable dishes before but this was the first time I cooked this one. Excited, quite nervous and acting like I know what to do. Prepare all of the ingredients! Heat a wok then pour-in the cooking oil. Turn on the stove ok? Sauté garlic and onion. Use cooking scoop for this. 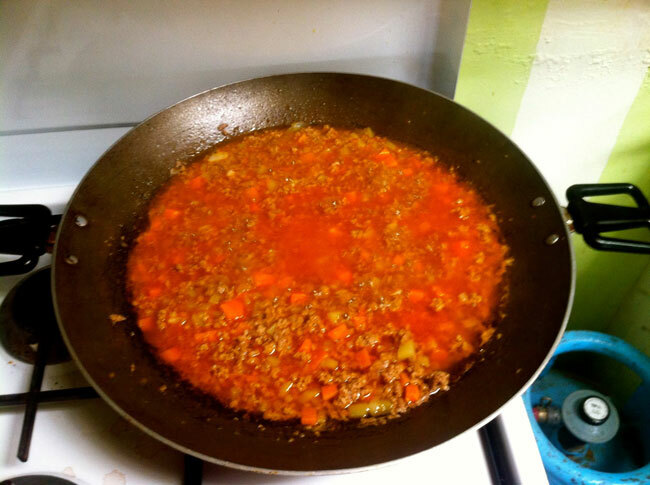 Add the ground pork, carrots and potatoes. Stare for a while. Stop staring. Pour-in tomato sauce and water. Let it simmer for 20 minutes. Do some other stuffs. Stop fooling around. Add pepper, sugar and salt. Stir properly. Don’t overcook it or else Chef Gordon Ramsay will *****! Transfer to a good looking plate. Make it look like you’re dining in a restaurant with a lot of stars. And most important, don’t forget to take a picture! Make it look tasty and let people crave for it! Last but not the least, serve with love! I think I deserve 3 Michelin Stars for this! Hahaha. It looks fantastic. Isn’t it? So what should be the next dish I’m going to cook? If you want to sponsor for the ingredients, please don’t hesitate. I will surely make that dish extra special. Just contact me. This entry was posted in Food Corner and tagged beef, favorite, food, giniling, ground beef. Bookmark the permalink.